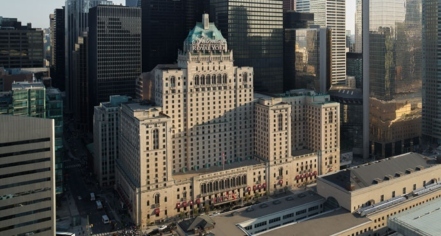 The Fairmont Royal York was built in 1929 on the grounds of what was once the Queen’s Hotel, across from Union Station, and was intended to be the largest hotel in the Toronto area. When the property was purchased by the Canadian Pacific Railway, they declared it would be the largest hotel in the Commonwealth, and for good reason: it featured 28 floors, 10 elevators, 1,048 rooms, and had private showers and bathtubs. There was even a hospital, a concert hall, and the largest hotel kitchen in Canada. It was considered a city within the city. Renovations throughout the years have increased the number of rooms to over 1,300 with the addition of the East Wing, an indoor garden was created to supply the restaurants on-site with fresh ingredients, and opulent touches were added throughout. The hotel has seen over 40 million guests in its time, including members of the Royal Family and famous celebrities. This luxury historic hotel presents guestrooms decorated with antique reproductions, rich fabrics, marble baths, pillow-top mattresses, and exceptional hospitality in a world class city. Guests can expect their rooms to be outfitted with plush bathrobes, HD televisions, fully-stocked mini-bars, and windows that open for fresh air. The fitness center features treadmills, elliptical and rowing machines, free weights, and stretching areas. There is a whirlpool, an indoor heated pool with a sky light, saunas, and steam rooms in the spa. Those seeking deeper serenity can partake in massage therapy and can opt to include aromatherapy. On-site are six restaurants, including Canada’s only Benihana Japanese Steakhouse. Fairmont Royal York can host meetings in over 30 function areas, as well as hold weddings of up to 1,670 people. Locally, Fairmont Royal York is in a great location. The convention center and CN Tower are within a three-block radius, while the local dining options featuring dynamic, diverse dishes are nearby, like Le Papillion, Byblos, and E11even. Those seeking artistic inspiration can visit the Royal Ontario Museum, which has over 6 million artifacts, or the Art Gallery of Ontario, with more than 80,000 works. In just under two hours, guests can be at the majestic Niagara Falls and admire one of North America’s greatest natural wonders. Fairmont Royal York, a member of Historic Hotels Worldwide since 2018, dates back to 1929. The Royal York was once the tallest building in Toronto, for one year, until the Canadian Bank of Commerce Tower was built in 1930. Deposit: Subject to rate booked. Parking: Valet parking is available; fees apply. Pet Policy: $50.00 CAD per pet, per day. Restrictions may apply. Rollaways: Available upon request; $25.00 CAD per night. The Fairmont Royal York was built in 1929 on the grounds of what was once the Queen’s Hotel, across from Union Station, and was intended to be the largest hotel in the Toronto area. 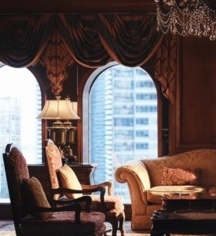 Learn more about the History of Fairmont Royal York .